When Hull House, founded by legendary social activist Jane Addams, closed down early this year, the reverberations of the failure of the nation’s most famous settlement house were somewhat muted. Was it that the modern era Hull House was so different from the Hull House Addams described in her autobiographical 20 Years at Hull-House that the place had lost its symbolic meaning for the nonprofit sector? Might there have been the presumption that the day of Hull House—and perhaps much of the settlement house movement that flourished around the turn of the century—had simply passed? Or, was the bankruptcy of Hull House, despite the organization’s amazing history, just another example of a nonprofit caught in an exorable spiral of decline due to the usual factors we all associate with nonprofit shutdowns? Although the settlement house movement doesn’t add up to the hundreds of facilities that existed in the decades before World War I, many settlement houses that got their start during that era still exist, function, and in some cases, thrive. Examples include the Henry Street Settlement in New York, founded by Lillian Wald in1893, University Settlement in Cleveland, founded in 1926 to serve the Broadway/Slavic Village neighborhood, and the Community Settlement Association, serving the Eastside neighborhood of Riverside, Calif. Was Hull House, founded by Addams in 1889, destined to die, or could it have modified itself to survive and thrive? Originally, the settlement house was not about the delivery of charitable services. Rather, like Addams’ Hull House, it was meant to be an inner-city residence for settlement workers who would deliver educational, art, music, and cultural programs to address the spiritual poverty of poor people. Typically, like Hull House on Chicago’s Halsted Street and the Henry Street Settlement in the Lower East Side, they viewed poverty as more than a financial condition. Largely directed, initially, by affluent but socially concerned people like Addams, the early settlement houses and settlement workers, many of them volunteer, saw themselves as bridging a socio-economic chasm, helping the poor immigrant communities surrounding them while also learning from their poor neighbors. But in learning from the poverty-stricken, often immigrant neighbors, the settlement houses became political institutions, beacons of advocacy for issues such as an increased minimum wage, labor rights, child labor laws, and decent (and nondiscriminatory) provision of public services. In a memorable part of her 20 Years at Hull-House, Addams wrote about her advocacy for improved garbage collection and sanitation in the 19th ward where Hull House was located, pressuring the alderman for better services, and eventually serving for a time as the ward’s garbage inspector to identify for the city exactly where the garbage was that needed to be addressed. Just think of the people who lived and worked at Hull House: Mary McDowell, who worked to support the trade unions in Chicago’s “back of the yards” neighborhood; Frances Perkins, who later became the U.S. secretary of labor and the first woman appointed to the presidential cabinet; Julia Lathrop, who became the first woman to ever head a federal bureau when she became director of the United States Children Bureau; and Florence Kelly, who became head of the National Consumers League. As for Addams, the founding director of the FBI, J. Edgar Hoover, called her “the most dangerous woman in America.” Theodore Roosevelt admired her greatly, but also called her dangerous when she became one of the most famous and influential pacifists opposing U.S. entry into World War I. Although she seconded Roosevelt’s nomination for president in 1912, she broke with him when he refused to allow African Americans to be part of his Progressive (Bull Moose) Party. A co-founder of the NAACP, the Women’s International League for Peace and Freedom, and the American Civil Liberties Union, she probably deserved and appreciated the Hoover epithet. Addams might have been seen by J. Edgar as a dangerous radical because she invited anarchists, labor organizers, and others to lecture or even conduct meetings at Hull House, but the accomplishments of Hull House would make her an essential woman in turn-of-the-century America. Among Hull House’s feats that have shaped much of what we know today are these: it created the first public playground in Chicago, the first public gymnasium in Chicago, the first public swimming pool in Chicago, and the first citizen preparation classes in the United States. Believing in the importance of facts and data, Addams led Hull House into investigations of sanitation, truancy, tuberculosis, infant mortality, and cocaine use in Chicago, prompting changes in laws and public programs. In its first few decades, the Hull House of Jane Addams was a beacon for social change and the delivery of services was secondary, or even tertiary, in the original settlement house concept. On January 19th this year, the leadership of Hull House announced that the organization was going to shut down in the spring due to a lack of money. A week later, it precipitously closed its doors and laid off its entire staff with no notice, no compensation, no payment for accumulated vacation time, and no health benefits. It was a remarkable turn of events for an iconic institution. In this brief piece, we cannot possibly provide a comprehensive analysis of all the challenges and mistakes that might have been made over more than 100 years of Hull House operations, but the various elements of news coverage suggest hypotheses as to possible causes of death and lessons for us all. A Bad Case of Founder’s Syndrome? Founder’s syndrome is a cute piece of nonprofit parlance that sounds trivial in the context of Jane Addams. In most instances of founder’s syndrome, one finds the story of a longtime executive director who has to be dragged from his or her office kicking and screaming. Addams was actually relatively ill for some of the later years of her life before she died of cancer in 1935, so she had been letting go of Hull House for some time. The issue wasn’t about her not letting go, but it might have been more about who among her potential successors could claim the mantle of “owning” and living the ideas of Saint Jane. According to most histories, after her death, the battles over the operations of Hull House between the head resident who followed Addams, Adena Miller Rich, and the president of the board of trustees, Louise deKoven Bowen, occurred daily—on everything, big and small. Before, Addams was both head resident and in control of the board. The split played out terribly until Rich resigned. Subsequent head residents (the title was later changed to “director”) displayed their distance from the ideas and direction that Addams had displayed so forcefully for so many years. In the case of Hull House, this might have been one of the worst cases of founder’s syndrome possible, in that Addams’s successors in no way measured up to her, or perhaps didn’t even grasp some of what she might have meant by the socialization of democracy or Hull House as a “cathedral of humanity.” Some shoes are almost impossible to fill. That is a tough model to pursue over time. Addams herself took to raising money, though she encountered the problem of many of today’s nonprofits with offers of financial support from corporate philanthropists who made their money through “unscrupulous” schemes. Eventually, Hull House took to raising charitable money in competition with others and raising rents on the apartments it developed in its 13-building compound. Moreover, it shifted from a largely volunteer operation to a paid staff. That may sound quaint in today’s terms, but it was a major shift in organizational culture for Hull House. While other settlement houses—not much different than Hull House at their outset—made the shift from volunteer operations to becoming more like nonprofits, it seems that the evolution for Hull House was never particularly comfortable or easy. The Loss of the Physical Settlement? After Addams acquired the house on Halsted Street, she acquired other properties in short order until Hull House became a thirteen-property complex. In the 1950s and 1960s, it became part of the Near West Side Urban Renewal project. Mayor Richard Daley decided to target the removal of Hull House in a plan to develop the campus of the University of Illinois at Chicago. Only the original Hull House was maintained as a museum on the university campus, but the rest of Hull House was demolished. The Hull House program became a federation of community centers around Chicago, growing to 29 program sites by 1985. Had the urban renewal of the Hull House properties meant that the organization finally morphed from a settlement house—a physical site in a poor neighborhood where the settlement residents connected with low income immigrants—to a provider of community center programming, sort of a more typical nonprofit? As Hull House expanded its operations into different neighborhoods, it developed the illness of the rapid process of scaling up: deficits. By 1967, Hull House had a deficit of $2 million and the various Hull House centers were competing against each other for charitable support. How many multi-faceted, multi-program, multi-site organizations do we encounter regularly only to learn that fundraising priorities are not only not coordinated, but sometimes sites and programs are cannibalizing the same funding sources? A big program expansion like Hull House’s (it became the Hull House Association after it converted from the Halsted site to a confederation of programs) doesn’t work on a fundraising scheme of assuming the funding will be there when the programs prove their mettle. Hull House had to contract, shave programs, eliminate facilities, and constrain vision. Sometimes problems of geographic and programmatic growth create strains that organizations cannot recover from, ever. A Failure to Ask for Help? Could the successors of Jane Addams admit their shortcomings? Could they admit to facing financial challenges, exacerbated by program modifications and re-modifications and more that simply weren’t up to the task? 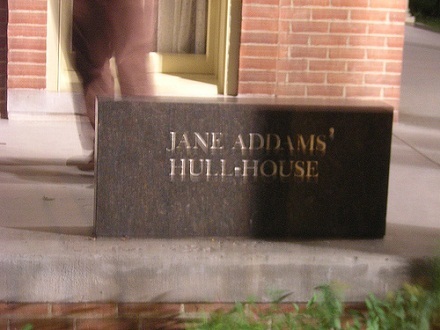 Renaming the Hull House Association the Jane Addams Hull House Association (JAHHA) didn’t meant that the spirit and creativity of Addams herself suddenly flowed through the organization. When the organization announced it was closing and going out of business, observers were surprised by the news. One historian on Addams, Grinnell College Professor Victoria Brown, couldn’t figure out why JAHHA leaders hadn’t publicized their financial problems earlier. “I wish we would have known. Why weren’t they screaming this from the rooftops,” Brown told the Associated Press. It would seem that Hull House fell prey to the all-too-common nonprofit affliction of presenting the image that there’s nothing fundamentally wrong with the organization, that funding will build on strengths rather than remediate problems such as, in JAHHA’s case, millions of dollars of debt. For close observers, the signs were there years—perhaps decades—ago. After the effort to increase government funding in the 1990s, a new director took over in 2000 and shifted the organization’s programs from an array of job training, elderly services, and family and support services to a narrower program focus because, in his view (as paraphrased by the Chicago Tribune), “it may have been trying to do too much with too little.” But big lurches in program focuses are also a telling sign of trouble, and sometimes a sign of an agency looking at government funding opportunities in a hope that it will land on a healthy, sustainable program direction. Usually, it is just the opposite. Reading anything by Addams, who was beyond prolific, one comes away with a strong sense of her kindness and openness. People who knew her confirm it, remarking on her propensity to hug all the little kids and to greet everyone personally. She was hardly the all-too-common manager of today, even in some nonprofits, who barely acknowledges subordinate staff and treats employees like, well, employees. With the closing of Hull House, the shocking news was of course that its 300 employees received only a week’s notice, were not paid for their accumulated vacation days, and had not been told that their health insurance hadn’t been paid for a couple of weeks. It was a shocking cultural change for Hull House that had perhaps been there for a long time, but treating employees so shabbily was evidence that something at Hull House had changed irreparably. Organizational culture is incredibly hard to change by direct action, but when it changes by slow, invisible accretion, the results can be harmful and debilitating. An Over-dependence on Government Funding? At one point in Hull House’s troubled modern history, it was looking for money from the city government and Oprah Winfrey to pay for expansion of its facilities. It was 1994 and the organization’s budget had more than doubled from $10 million to $22 million in a period of only four years. Although the city and the talk-show host were playing their usual roles, there was a feeling that the organization was looking for lifelines at a point when it should have been consolidating and taking stock of its situation.